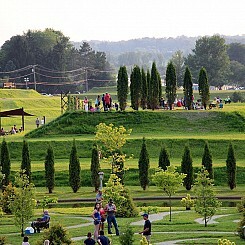 Inspired by the works of American landscape architect Charles Jencks, the terraces add a dramatic vertical dimension to the landscape. Curvilinear reflecting ponds surround the terraced hillsides, and spiral paths lead up to the terrace peaks for bird’s-eye views of the park. Another breathtaking aspect of the terraces is the River of Glass. It pays homage to PPG Works No. 11, honoring the significant contributions of the family members who worked for PPG. 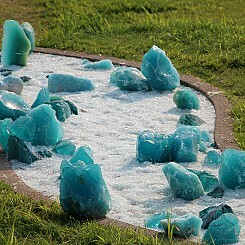 Flowing down one of the hillsides near the Schnormeier Events Center and Tree of Life Labyrinth, it is fashioned with chunks of glass, called “cullet”, and crushed glass. 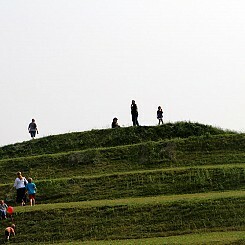 My kids like to climb up and run down the grassy paths.